Michel Aoun’s recent statements have been interpreted by some as an attempt to bring President Michel Suleiman’s term to a premature end as a prelude to replacing him. Aoun’s apparently commented during the Doha conference that he would accept Michel Suleiman as president but only for two years. The FPM has denied the allegations, insisting that Aoun’s statement is part of its parliamentary role in promoting institutional accountability. Is the Reform and Change parliamentary block that represents the FPM trying to live up to its name or is this really a power grab? I respect Saoud a lot and appreciate his proper investigative journalism which is very rare in Lebanon, but I think on this occasion he has inadvertently revealed how the FPM sees itself and the limits of its ambition today. Many people criticise Aoun for his political ambitions, but I never thought that was the real problem with him and the FPM. Aoun’s ambitions made the FPM the only party in Lebanon to field candidates outside of its ‘natural’ constituency, that is areas with a Christian majority, and get as close to a comprehensive national list of candidates as possible. This is good for democracy in Lebanon and probably the only way at present of challenging the strict confessional correlation between the electorate and their representatives, especially in the absence of electoral reform. But this was a unique attempt; all other indications suggest that Aoun is now content with being a Christian leader and that he has given up on creating a national movement. This does not sit very well with many in the FPM, particularly among the youth, but Aoun no longer feels that he has to justify himself to this section of the movement. His choice of parliamentary candidates illustrated this very visibly, many competent young leaders in the FPM were sidelined in favour of more ‘traditional’ candidates. Big money, big bellies and old families neatly sums up this ‘tradition’. The choices alienated many in the movement, but there are no visible signs that this will lead to any meaningful protest or challenge to Aoun’s authority. Aoun is doing all he can to consolidate his Christian powerbase, and the FPM is now content to go along in being the largest Christian party. The tension between the aspiration to be a national political movement and a Christian party has always existed within the FPM. To a certain extent, the movement thrived on the nuances of language that the different camps within it used: moderate in Beirut but more Christian in the mountains. But now it seems that Aoun has finally made up his mind. It’s not his excess of ambition that should worry us, but its lack. 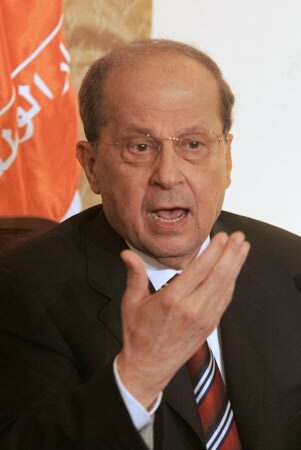 Aoun’s satisfaction with being a Christian leader is the clearest manifestation of this lack of ambition. A national political movement remains elusive for the time being.